At certain times, everyone has to face problems surrounding tooth decay, and older, dying teeth. Proper dental care and maintaining a healthy diet are sometimes not enough to avoid cavities and fillings. Dental crowns are the most efficient way of salvaging a damaged tooth. With a dental crown, your tooth can be restored and protected from future damage or decay. Dental crowns are protective caps that are placed over a patient’s entire tooth, they act to protect against bacteria, breakage and further decay. Once a crown is in place, the patient’s tooth will look and feel relatively the same. Dental crowns are an essential part of preventive dental care, and can help stop future, more serious oral problems before they start! Crowns are full coverage restorations that are used to cover a tooth that is likely to break or is too broken down to be restored with a filling. They are most commonly done afterroot canal treatment, or when a large filling wears out. The larger the hole made by a cavity that has to be treated, the more likely a crown will be needed. Even after a filling is put in a large cavity, a tooth is more likely to break. Dental crowns hold the tooth together, even if it is almost hollow from a root canal or other procedure. Crowns placed on a weakened tooth, providing strength and protect the tooth against breakage. They protect the patient from intrusive and harmful bacteria present in the mouth. Abroken or cracked tooth is a far more serious matter and much more difficult to treat. Crowns help prevent this, as well as providing a nice, filling free smile. It takes two appointments to restore a tooth with a crown. In the first appointment, any decay is removed from the tooth and it is shaped properly in order to accept the crown. Then an impression is made of the tooth for use in fabricating a crown. Between the two visits, the crown is made, usually of high-strength porcelain over gold alloy, all ceramic material, or gold. During this time a temporary crown is worn. In the second visit, this temporary is removed. Then the permanent crown is adjusted as needed and then cemented in place. How is a Crown Performed? Your dentist will give you a local anesthetic, or if you would rather, they will sedate you for the procedure. Getting a dental crown is not painful if the area is locally numbed, however, some patients prefer full sedation. To ensure the crowns fit properly on the patient’s old tooth, your dentist will file the tooth that needs to be restored down to ensure the crown looks, feels and fits like your old tooth did. An impression of the filed-down tooth and nearby teeth will be taken in order to perfectly re-create a patient’s specific bite. This impression customizes the crown to your mouth so it will fit seamlessly. The crown is created using restorative materials, molded from the impressions that were taken. This ensures that the crown is the right shape for your mouth. Your dentist may place a temporary crown on the tooth that has been filed down. It may not fit as perfectly as the tailored crown that will be added. However, it still protects your tooth until the final crown is ready. The coloring of the temporary crown may not match your teeth exactly. Once your crown has been created our dentist takes off the temporary crown and puts on the final one. Your dentist checks to make sure the crown is the right fit, shape, color and bite. If it is, your dentist cements the crown into place. Crowns are made from many different types of materials. Your dentist will ask your preferences with regards to the materials used, and they will help to pick the product that matches the color and texture of your teeth specifically. These are most often made of gold. Gold crowns can last a very long time and are excellent at protecting the tooth underneath. They will not break or chip like your other teeth. However gold crowns can have a wearing effect on the teeth around it. That is why your dentist may suggest you wear a night guard to prevent grinding your teeth against the gold crown. Aesthetically speaking, another downside of getting a golden crown is that it will not match the natural color of your surrounding teeth. Gold crowns are historically the most common material crowns are made out of, however, now there is the technology to create materials that better match your surrounding teeth. Gold crowns are still widely used, they are generally used on the molars, rather than a patient’s front teeth, so that they are not seen, but still effective. These crowns are more modern and are widely popular with dentists today. They are more cost efficient than golden crowns and will not wear the surrounding teeth as badly as gold crowns would. Crowns made from composite plastic bonding are artificially manufactured, they are not a metal or naturally found substance. They, therefore, can wear faster from chewing, when compared to their metal and porcelain counterparts. Composite crowns can be easily affected by stains and cannot be whitened v=back to their original color like regular teeth. When brushing your teeth with a composite crown, be aware that these crowns can be easily scratched and chipped, they have a delicate outer layer similar to tooth enamel that can wear out if you are brushing with abrasive materials. Of all related crown types, porcelain can be said to appear as the most natural when compared to the surrounding teeth. 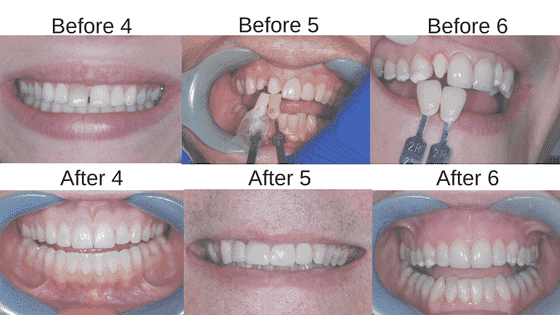 They can chip more easily and are more delicate than the metal and composite crowns. Like gold crowns, porcelain crowns have been used throughout history, to create a seamless appearance when compared to the surrounding teeth. Porcelain crowns are not as strong as metal crowns, however, they do provide a more natural look. If you are able to care for your crowns properly, they can last you for upwards of 10 years. Crowns can be cleaned just like regular teeth. They are the best way to salvage a broken or dying tooth so that a patient can retain a set of natural teeth in their mouth. In order to keep your crowns looking their best, avoid biting down on exceptionally hard food items, remember that crowns are a protective treatment and that they cover your old teeth below. Be sure to treat them with care. Crowns are not as strong as your natural teeth, even if they are made out of metals. With that said, they are the best resolution when it comes to maintaining a natural looking smile filled with your natural teeth. Your crowns will look and feel just like your old tooth and will last over a decade. If you are thinking of getting crowns, or are needing your old crowns replaced, visit LA Dental Clinic for a consultation with one of our dentists.